Fares begin at $1,799 per person, plus $199 for port charges, and include 3 meals a day, on-board entertainment, early morning pastries and Bloody Marys, early evening snacks, Rum Swizzles, and 24 hour coffee, tea and water. Sunrise in paradise, lifelong new friends, warm clear turquoise waters, breath taking views, and more. This island is the largest of the British Virgins and as British as Pusser's Rum. Tortola is crowned with peaks rising into the clouds, including Sage Mountain tropical rain forest. Roadtown is the charter boat capital of the world. 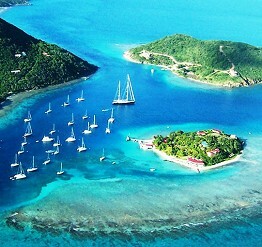 Tortola is a favorite of yachtsman for all its sheltered bays and anchorages. The famous Bomba Shack offers dancing and good cheer. Named for an early Dutch settler (and once a pirate), Jost Van Dyke offers rugged scenery and colorful folklore. Explore sugar mill ruins, trails that crisscross the island and the East End's natural sea-formed Jacuzzi, or look for whales and dolphins. And be sure to stop for a rum punch or two at Foxy's or the Soggy Dollar Bar. Norman Island is reputed to have inspired Robert Louis Stevenson's Treasure Island. Legend has it that pirate treasure is buried at a natural formation called the Indians, which are half-submerged rocks forming an underwater labyrinth for divers and snorkelers. The island is deserted but for a few seabirds, several footpaths, and the Billy Bones bar. One trail leads to Spy Glass Hill, a challenging half-hour hike rewarding you with fantastic views. Pirates once used this lookout to spot Spanish Galleons returning home with gold and treasure. A popular yacht anchorage, Peter Island is known for its beautiful beaches and perfect picnic spots: Deadman's Bay, Great Harbor and Sprat Bay. The Royal Mail Steamer R.M.S. Rhone sank just off the coast in 20-80 feet of ultra-clear water. Adjacent Salt Island, where salt drying ponds are still maintained, is one of the most popular scuba and snorkel spots in the Caribbean. When you think of Virgin Gorda, you think The Baths - one of the Caribbean's natural wonders, a spectacular formation of gigantic boulders, creating grottoes and caves that you can explore on foot. The island is home for the famous resort of Little Dix Bay, as well as the Bitter End Yacht Club.